The Panasonic KX-TG8064EW is one of the best quad sets of budget cordless phones available; boasting great sound quality, dependable range, and user-friendly features. Recommended by Which? as a ‘Best Buy’, the 8064 is a reliable choice of landline phones that delivers remarkable value for money. Each handset features Panasonic’s innovative high-precision error correction system for smoother, more natural sounding conversations on your landline. It detects and eliminates distortions and glitches of sound for excellent clarity, whether using the ear-piece or of the in-built loudspeaker for the convenience of hands-free. The handsets further benefit from a 2.5mm headset socket should you wish to add a compatible headset. 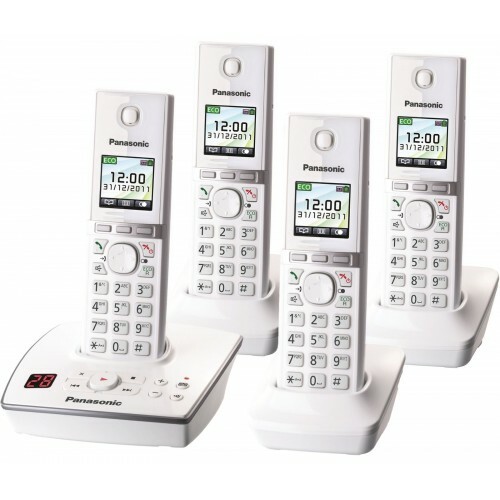 Whilst it may be at the lower end of the budget spectrum for a set of four cordless phones, the KXTG 8064EW from Panasonic is packed full of DECT features to take advantage of. You can manage calls effortlessly with call management features, such as: call transfer, conferencing, 200 name and number address book, and an in-built answer phone. And with the one-touch ECO mode you can make more efficient use of your energy. Delivered reasonable well and easy to install. I had looked for a white 4handset wallmountable system without success, so I was suprised to find that this model was wall mountable although not advertised as such. I love the white - it does not get muddled up with other handsets and the back-lit screen is great. Excellent price for a lovely set of good quality phones. Very speedy delivery and a bonus being able to track parcel. Will certainly use this site again.